CSA is CLOSED for the season. Community Supported Agriculture (CSA) is a way for farmers and consumers to form a direct connection through the growing season. This eliminates the middleman, the long distance transportation of perishable foods, excessive handling and storage, and allows the farmer to harvest each crop at the peak of ripeness and flavor. Early in the growing season, customers buy a “Farm Share” of the harvest to come, thus guaranteeing a weekly supply of the freshest, tastiest vegetables and berries possible. This early purchase helps the us cover the early expenses of seeds, supplies, and labor. 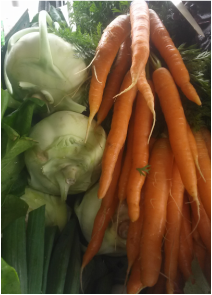 Our CSA season will run June 3rd through October 28th (22 weeks). Each week you will receive a large grocery bag containing a variety of fresh produce. A Small Share will feed 1-2 people and a Farm Share will feed three or more people. Purchasing our CSA saves you approximately 10% over the season. The items in your bag will vary each week as the season progresses, with more available as the weather warms. asparagus, beets, broccoli, carrots, chard, lettuce, peas, rhubarb, spinach, and strawberries. beans, cabbage, corn, cucumbers, garlic, kohlrabi, lettuce, sweet onions, tomatoes, strawberries, and summer squash. beets, cabbage, carrots, garlic, kale, lettuce, leeks, onions, potatoes, pie pumpkin, spinach, and winter squash. You will also receive a weekly newsletter or email with a list of that week’s produce, farm news, and interesting tidbits. 5% off anything you purchase from us at the farm or farmers market. Notifications of any sales and winter time produce availability.